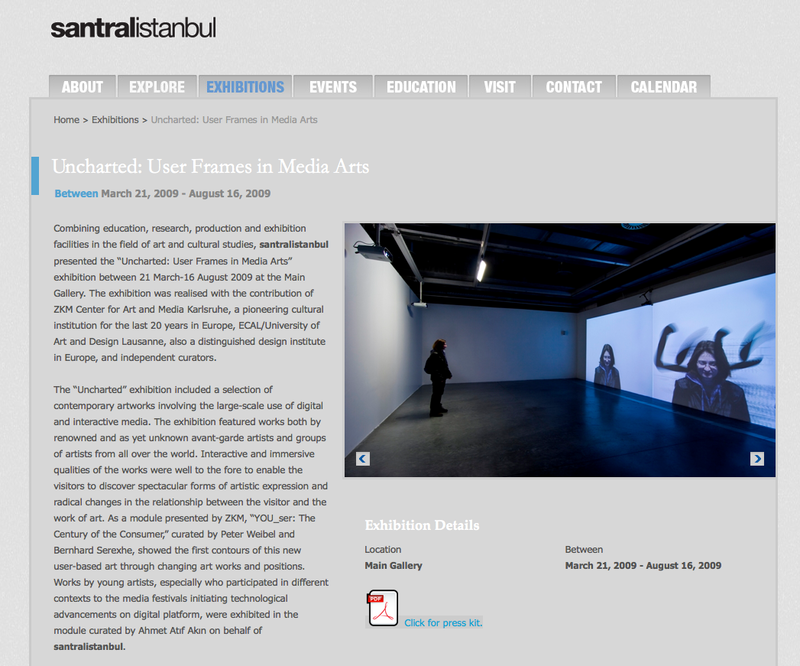 Combining education, research, production and exhibition facilities in the field of art and cultural studies, santralistanbul presented the “Uncharted: User Frames in Media Arts” exhibition between 21 March-16 August 2009 at the Main Gallery. The exhibition was realised with the contribution of ZKM Center for Art and Media Karlsruhe, a pioneering cultural institution for the last 20 years in Europe, ECAL/University of Art and Design Lausanne, also a distinguished design institute in Europe, and independent curators. The “Uncharted” exhibition included a selection of contemporary artworks involving the large-scale use of digital and interactive media. The exhibition featured works both by renowned and as yet unknown avant-garde artists and groups of artists from all over the world. Interactive and immersive qualities of the works were well to the fore to enable the visitors to discover spectacular forms of artistic expression and radical changes in the relationship between the visitor and the work of art. As a module presented by ZKM, “YOU_ser: The Century of the Consumer,” curated by Peter Weibel and Bernhard Serexhe, showed the first contours of this new user-based art through changing art works and positions. Works by young artists, especially who participated in different contexts to the media festivals initiating technological advancements on digital platform, were exhibited in the module curated by Ahmet Atıf Akın on behalf of santralistanbul.